Stories are very seductive and powerful, and we tell many types. A good story, in film, print, or spoken, can quickly transport us a different world, both emotionally and rationally, faster and deeper than perhaps than any other device. Given how easy it is for us to lose ourselves in our stories, we should take extra care that they make sense, and are adaptive. Jonathan Gottschall’s The Storytelling Animal: How Stories Make Us Human (2013) explores our universal craving for stories, and offers a theory of why they are so compelling. A good story will simulate reality with a very reduced set of causal factors, giving us a simple narrative that nevertheless creates mental models that we can use to help us prepare for and adapt in a much more complex and less comprehensible world. Getting those models right is clearly an important challenge, and it is much easier to hook people into a story than it is to make that story reflect reality. Books like Lisa Cron’s Wired for Story (2012) or Carmine Gallo’s Talk Like TED (2015) will give you plenty of tips for exploiting human cognitive desires for simple, dramatic, comprehensible stories. That is all good advice, as long as your manipulation remains ethical and truthful, and such advice will help make you successful with others, but you will make a big mistake in your career of you confuse being popular or well paid with actually making a difference. If you want to really help people prepare for the future, you’ll have to get beyond being entertaining to truly adding value with your stories. You’d like your stories to produce adaptive foresight for your clients. Let’s discuss that challenge now. The Three Ps offers us three basic types of future stories: Probable, Possible, and Preferable stories. There is also a fourth category of stories, Faulty stories, that we must be able to identify. 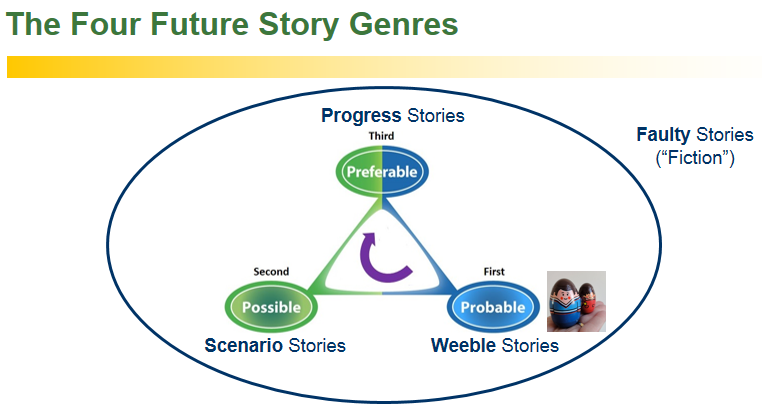 We can call these the Four Future Story Genres, using the same term, genre, that we use to categories various types of writing. The first three of the four genres, Possible, Possible, and Preferable stories, are all nonfiction foresight. Weebles is my preferred term for the kind of relevant, well-critiqued Probable future story that is most worth telling. Scenarios is the preferred term of foresight professionals for possible futures. Progress stories is a good term for a special set of preferable futures that are particularly widely agreed upon by the relevant stakeholder community. Faulty stories are future stories that are implausible as written, in one or more critical parts. In those parts they are clearly fiction, not reality. They may be entertaining, but if we don’t point out their flaws, we’ll be influenced by them, and our understanding of the future will suffer. There are lots of foresight methods books that teach scenario development approaches, but not yet many books yet used in the foresight community that will help you with the other four future story types. Nevertheless, getting better at recognizing and telling all four future story genres, in the right contexts, is a key skill for the foresight professional. The first point to recognize with respect to these four genres is how they distribute in our culture. Just over half the titles in a typical large bookstore (some 55%, in some research I did in a Barnes & Noble) are in the nonfiction genre, with hundreds of subgenres. The other half of a bookstore (even higher in many smaller bookstores) is typically fiction, again in hundreds of subgenres. This ratio offers us some weak evidence that we human beings like to be entertained, first and foremost, by fictions. You could even say, as Gotschall and others would, that most of us live our lives almost entirely within these fictions we construct in our heads. To be sure, we also like to learn real things about the world, but only as a second level priority. Entertainment, and making simplifying mental models, appears, by all accounts, to be an even stronger collective drive. Just look at all the money we spend on fiction movies, versus documentaries and other nonfiction. Reality television has evened that out a bit in recent years, but I’d bet we’re still an entertainment first, reality second culture, in every developed nation. So it helps to remember that all humans, including our audiences and clients, are experience seekers as well as model makers. We love a good story with both likeable and odious characters, with mystery and unpredictability, with a compelling set of narratives, dramatic tension, and complex emotion. Whether the story and its implicit models are true on a rational level is, unfortunately, usually of secondary importance. It need only be true to our emotions and values for us to love it and be strongly influenced by it. That’s why we love future-oriented films like Star Trek or Star Wars so much. We know these stories couldn’t happen as written, but as long as there is some cool “future candy” (interesting bits, fast food for thought) in the presentation, the plot holes aren’t large enough to pull us out of the experience, and the emotions and values seem right, we can be deeply entertained and influenced. Makers of propaganda, a special kind of faulty story used to influence others, have long known that the truer we make a story emotionally, the easier it is to slip in falsehoods on a rational level. It’s also obvious that the wealthier our societies get, the more the average citizen seems to prefer entertainment first, and reality second. This entertainment drive is a basic trait of human nature that all professionals must understand, and work within, if we want to improve foresight culture in any organization. Learning to identify faulty stories, and never tell them as truth, is one of the basic ways we establish credibility in our profession. Recognizing that certain parts of a future story sound more like fiction than future reality allows us to be entertained by that story, while keeping it from influencing our or our clients strategy. Unfortunately, many elements of faulty stories are not recognized as such, either by the teller or the audience. We aren’t sufficiently critical in evaluating the story’s plot elements. We get wrapped up in the drama. 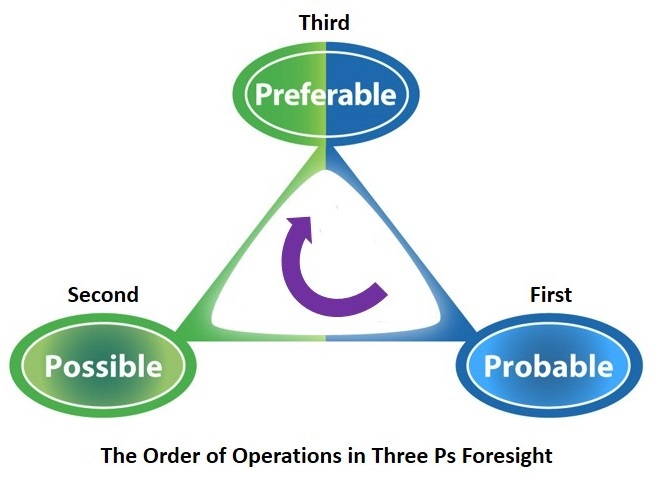 Recall our order of operations for the Three P’s Foresight types. Following this order is particularly important when we wish to generate stories that are not faulty. Unfortunately, many future stories we find in print, including many scenarios (stories of possible futures) published by foresight professionals, are highly implausible as written. In fact, many scenarios offered as future possibilies seem so implausible, even only part-way into them, they are waste of time for practical-minded folks to finish reading. In just a few sentences, a poorly written scenario can demonstrate the author’s ignorance of key trends and aspects of the probable future, and signal that we are reading future fantasy, not plausible reality. Scenarios should be developed only after a foresight professional has explored the spectrum of probable foresight that seems relevant to the story. They also should intelligently explore plausible but different possible futures, and deeply address the competing and cooperating preference landscape in relation to the future being contemplated. If they don’t do these three things, they actually hurt the reputation of our emerging field. We’re offering these stories as plausible, when our evidence-based audience realizes they really aren’t. Generalist futurists who like to learn and write in many areas, and creative futurists who like to imagine alternative worlds, are two types of practitioners who are particularly in need of strong criticism of their stories. Their generalist tendencies and creative minds can lead them rapidly to opinions, predictions, and stories that sound great at first blush, from at least from a few perspectives, but which are implausible, impossible, illogical, impractical, or even ridiculous on closer examination. All foresight professionals must speculate at times, and creative thinking will often lead us to new insights, but our speculation needs to be kept subject to our professional and organizational objectives. Speculation also should be compartmentalized, or confined to the proper times and places, or it becomes confused with reality. We all know a few people who can’t do this compartmentalization, and they live largely in fantasies of their own creation. Paul and Elder’s Critical Thinking, 2nd Edition (2013) is an excellent text that tells us our creativity must be continually grounded both in reality and utility, if it is to be adaptive. Let’s look closer now at these four important classes of story that good foresighters must strive to collect, create, and understand. As mentioned, they cover all three corners of the Three Ps triangle, plus one additional class of stories outside that triangle. The first of these, weeble stories, are concerned with the probable future. The second, scenario stories, are concerned with the possible future. The third, progress stories, involve the preferable future. In the process of building these three types of stories, we will generate and find many faulty stories, which is the fourth class. Faulty stories that others still believe to be true can be used by organizations to strategic advantage. The good foresighter is familiar with and collects examples of all four of these kinds of stories. Let’s look at each of these four genres now. All serious professionals, no matter what they do in their private lives and minds, must strive to publicly tell and write primarily stories that have survived a great deal of expert and lay criticism, and thus have the greatest probability of coming true. We call those weeble stories. Because of all the criticism they have both received and survived, they become particularly valuable stories to understand and employ. The Weeble is a small egg-shaped toy, first sold by Hasbro in 1971, and still available today. Almost all of a weeble’s weight is in the bottom of the egg, so when anyone knocks it over, it gets right back up. As the commercials used to say, “Weebles wobble, but they don’t fall down.” A weeble story is an interesting and reasonable speculation, prediction, trend or other judgment about the past, present, or future that has seen a lot of past criticism, yet so far it has kept getting back up. Implicit trends or conditions seem to support it, so the story continues to stay plausible. A weeble story, then, is a description of the probable future that has survived a lot of criticism from a cognitively-, skills-, and experience-diverse audience. By doing so, it is a story that has earned the right to be taken seriously. Some weeble stories attract criticism, as when they are told by opinion leaders, they make some specific or strong future claims, when they go against current practice, are counterintuitive, or when someone will lose money or power or status or will have to modify their behavior if the story turns out to be true. Others don’t attract a lot criticism, either because are missing any of these factors, are technical, complex, or abstract, or for some other reason. In that case the author or user of the story will need to make an extra effort to get some important probable stories sufficiently critiqued for them to qualify as weebles. A good weeble story will be both meaningful (the future will change in important ways if it is true), and will have a history of continuing to stand back up after criticism. It progressively gains evidence and argument for it, because the current explicit and implicit trends or conditions appear to support it. As a foresight practitioner, you want to find as many weeble stories relevant to your client as you can, and try to come up with new ones yourself. These are the stories you want to tell to clients when they are ready to hear them, and when you think they will do the most good. Try to tell your more speculative “pre-weeble” stories in private conversations first with critical but supportive colleagues, and make sure they survive their criticism before sharing them more widely. If you must discuss speculations in public, make sure they are clearly acknowledged as speculations, and always ask for critique. If criticism is the best antidote to error, private criticism and public qualifiers are the best protectors of your reputation. For examples of some good weeble stories, think of Ghandi’s story about the inevitability of Indian independence, a story being told in British India in the 1930s and 1940s. Think also of the current story that women’s rights, democracy, and women’s suffrage must inevitably come to Saudia Arabia, North Korea, Myanmar, Sudan, Afghanistan, and other human rights holdouts in the next few years to decades, as the world grows ever wealthier and more digitally transparent, connected, and intelligent. Think of futurists in the 1990’s saying we’d inevitably have self-driving cars in the 2010s (their predictions turned out right for test fleets, but commercial use may only come in the 2020s, and will likely not be widespread till the 2030s). Think of technology forecasters saying in the early 2000s that we’d have computers we can talk to on our phones for simple things in the 2010s, and complex things in the 2020s. I actually that prediction in 2003, on my personal website, Acceleration Watch (then called Singularity Watch) in a post called The Linguistic User Interface. Here’s the original, from the Wayback machine, and here’s the updated version). Luckily, this weeble story turned out to be particularly accurate in its timing, as Siri emerged on the iPhone in 2011. At the end of this chapter, I will briefly tell a weeble story about Personal AIs (PAIs) (also called personal intelligent agents, personal sims, or digital twins), coming for all of us who might want them in the 2020s, as a predictable iteration of the next generation web. I’ve had this story strongly criticized since I began publicly telling it, in its first version, at the Foresight Institute conferences in Palo Alto in 2000. Our weeble stories may wobble, they may be poorly told and need to be corrected a lot at first, but if they are weebles they don’t stay down for long. It’s not easy to do controlled experiments in the foresight field. We can assess our foresight later for accuracy, but often the best we can do before the fact is to get our forecasts, predictions, opinions and speculations well-criticized, and prune away the most implausible ones. Criticism is also central to peer review, a prerequisite of good science. As automated semantic understanding and analysis tools improve, the level of critical and peer review for any future story will become more visible for all stories we find on the web. In the meantime, we must do our own investigation and criticism solicitation, using our ever more useful professional networks and the web. An exciting type of peer review called open peer commentary, where reviewers from a variety of specialties are solicited to publicly comment on a target article, and the author is allowed a brief public response to each published commentary. This is a particularly good way to show the level of criticism that exists for controversial, abstract, or speculative works. My colleague Clement Vidal offers an example of this kind of review in our Evo Devo Universe conference publication The Evolution and Development of the Universe (2009). I hope more foresight journals engage in open peer commentary in coming years. Some weebles are wildcards, stories about the future that we consider to be low probability events, yet if they occurred, they would have a high probability of disruptive impact, either positive or negative in effect. Besides the general class of relevant, high probability future events, we want to find relevant wildcards whenever we can. We also want to build scanning systems and early warning signals analysis for the occurrence of relevant negative events, and work out strategies for keeping negative events low probability, and reacting rapidly and efficiently to them if they do unfortunately occur. These are all examples of good risk management, a key foresight specialty practice. John Petersen’s classic, Out of the Blue: Wildcards and Other Big Future Surprises (1997), and Nicholas Taleb’s The Black Swan: The Impact of the Highly Improbable (2010) are two good introductions to wildcard identification and management. Taleb’s book also considers how wildcards impact a system’s robustness and its antifragility, or ability to learn and get stronger after any error or catastrophe. We’ll talk a lot more about antifragility in Chapters 7 and 11. Our largest class of future stories are scenarios, possible, or experimental stories. By this I mean not just formal scenarios, stories that try to transport us to a future setting, with multiple story elements, but any story of our possible future, one that can be invoked with a single sentence, or even a particular word choice. Recall again that half of a modern bookstore is fiction. Most general fiction, and even some fantasy, is an exploration of both plausible and possible pasts, presents, and futures. Human science and critical faculties can help us weed out some possible stories as faulty, but the vast majority of these stories will remain experimental, uncertain, unknown. For a good example of important possible future stories, think of the impact of humanity on climate change. Scientists almost universally agree that humans are causing growing climate variability and warming, but when we craft stories for the next fifty years, uncertainty reigns. We are literally conducting a vast global experiment with our behavior at present. Prudent governance would make us realize we don’t need to conduct this experiment, and don’t deserve to subject the next generation to the risk and uncertainty of massive climate change. Sometimes the experimental stories we tell will have downside risks that we are prepared to accept. In such cases, we use those stories to help us better choose between a variety of acceptable futures. This may be the most common way we use possible futures, to widen our scope of thinking, so we can better envision preferable futures. But other times, as with climate change, many of the downside risks are much beyond what we should be willing to accept. In that case, one challenge for the foresighter is to spur us or scare us into action to mitigate risk. We call such scare stories self-preventing prophecies, and they are a common tool of effective activists. In fact, some of our possible future stories are so low probability that they are negative wildcards, but we may feel ethically compelled to tell them nonetheless, to remind our audience of their extreme negative effects should they occur, and to generate impetus for action. Fortunately, partly because of good scare stories of possible futures, and good exposure to the uncertainty of our climate future, more and more of our societies are taking costly steps to decarbonize their economies. In other areas, like preventing pandemics, we aren’t telling nearly enough good scare stories to motivate change. We also aren’t telling the right weeble stories in relation to this major threat to our species. Molecular biologists know that viruses and bacteria have a very limited number of infectious strategies, controlled by just a tiny number of genes, that they use to get past our immune systems and cause havoc in our bodies. Meanwhile, our own immune systems have thousands of genes, and a large number of overlapping, independent protection networks, each of which works quite well, in almost all cases, to protect us. As we increasingly understand immunology and vaccines, at the level of cellular and molecular biology, and create ever cheaper and more realtime sensors and diagnostics, we are actually building technological immune systems that complement our natural biological ones. For one example, look at DRACO, an immune system adjuvant that we could all take, if this particular class of virus infected us, to make our own bodies kill the infected cells, and prevent its transmission to others. Eventually, there will come a point where no computationally simple replicator, like a virus or bacteria, will ever be able to threaten large numbers of computationally complex organisms, with their own complex immune systems. The only threats left to humanity, at that point, will come from other complex replicators, like people and their organizations. In this weeble story, it is only the understanding and augmenting immune systems, from the molecular and genetic level on up, that will finally solve the threat of terrorist, accidental, or natural pandemics. Everything else is just a stopgap measure. But to achieve this permanent solution we will need to spend the money, and we presently spend only a pittance on this particular threat. These molecular-scale biological defenses will therefore arrive early or late for our species, depending on the funding and political priorities of our wealthy countries. Once we understand this particular weeble story, we can can go about constructing better scare stories as well, and some good progress stories involving the right priorities, strategies, plans, money, action, and management to solve this problem. If we build and tell our stories well, we can make the end of infectious disease arrive on Earth before, rather than after, the next major pandemic. Whether this happens or not depends a lot on our opportunities to tell effective stories to the right people. Curiously, humanity appears to have a strong, species-level bias against telling too many stories about the preferred future. It has been far more adaptive for us, up until very recently, to point out the risks, dangers, and problems of the future. So we tend to tell progress stories only to ourselves, in quiet, as vague and hopeful ideas. But when we tell them out loud, and get them critiqued by others, we can make them much more practical and motivating. Getting you to collect and tell more of these stories, for yourself, is a big part of what we hope you will do after reading this Guide. Preferable future stories that are particularly widely agreed upon and motivating for the stakeholders can be called progress stories. We’ll treat those as their own challenge, Creating Progress Stories, in the next section. In the section after that, we’ll talk about Maintaining Intelligent Optimism, a mindset that will allow you to see preferable future stories, opportunities, and desirable futures, almost as often as you see risks, dangers, and problems ahead. The best stories of preferred futures recognize that both opportunity and risk always lies ahead. They help us to envision and achieve progress, while avoiding pitfalls along the way. 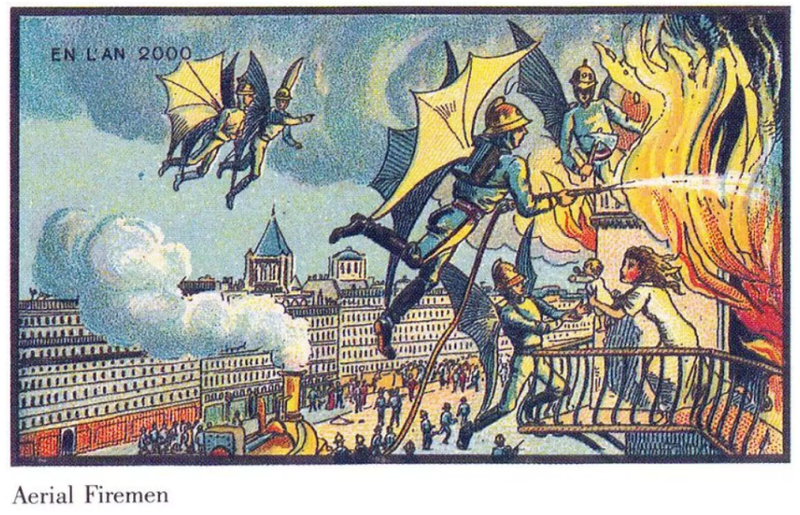 Firefighting in 2000, as envisioned by Jean-Marc Côté for the 1900 World Exhibition in Paris. One of a series of 87 images produced between 1899-1910. (Series title: In the Year 2000). Anyone with physical intuition in the 1900s would have recognized the wings in this image as a faulty story. Jet packs on firefighters is just as faulty, once we admit that firefighting aerial robots (drones) would beat out humans for efficiency and safety as well. Faulty stories are stories about the possible future that someone finds attractive, but that the right group of experts can also expose as implausible, in at least some of their critical elements. Just as life advances by trial and (lots of) error, our foresight advances by telling lots of possible stories, and separating out the vast majority of faulty stories from the remaining weeble, scenario, and progress stories. Most of our future stories have internal flaws that will keep important parts of them from ever occurring. Many of these flaws are eventually exposed as such, as our social wisdom grows. Just read any very old book of foresight, in the light of modern knowledge, and you can start to see recurring patterns in such stories, like the pattern where we assume we have a lot more control over all aspects of the future than we actually do. Finding faulty stories that others still believe, and learning how to bet against them, can offer great strategic opportunities. Scientific and technological stories that are mostly hype over the next generation include performance-driven human genetic engineering, nootropics, space elevators, molecular assemblers, desktop additive manufacturing, and many other often discussed things. Even standard tropes like artificial intelligence, the internet of things, robotics, and virtual and augmented reality are usually vastly oversold by the opportunistic press and the amateur futurist community. The more knowledge you have of the STEEPS constraints and drivers behind any story being told, the better you can determine if it is a weeble, possible, faulty, or progress story. One way to identify faulty stories is to examine the motives of the storyteller. If they are financially invested in or emotionally enamored by a particular future, they are often tempted to tell these stories without regard to all the evidence against them. But the most broadly effective way to identify faulty stories is to subject them to careful, open, and cognitively diverse critique. Faulty stories will very quickly be flagged by the a number of experts in the crowd. Only the true believers, those benefiting financially or reputationally, and those seeking entertainment or conflict will continue to tell them at that point. But just because a story is faulty doesn’t mean it won’t have deep or lasting influence on the future, or that we could easily end its telling by exposing its faults. Many people get value from telling stories that are obviously faulty in part, and they may serve deep moral or emotional needs. This is true with many of our religious, political, and motivational stories. We tell them and believe in faulty stories in spite of their faults, for their many obvious societal, community, and personal benefits. Nevertheless, we must strive to reform every story we choose to believe, so that its ratio of truth to falseness improves with every retelling. Exposing a story’s faults is a great way to reform it for the better. We’ll say more about responsible religious foresight in Chapter 12. Consider human longevity stories. Genetically-engineered biological immortality, of the kind proposed by groups like the SENS Foundation, is a popular but deeply faulty story, promulgated by a more naive branch of biological transhumanism. Any molecular biologist has a good understanding of the imperfect error correction and inevitable breaking down and trash accumulation that occurs in all complex biological systems, at the molecular scale on up, as they age. Some future intelligence, with deep ability to simulate quantum and chemical events, might be able to reverse that reality. But we humans certainly have no reasonable chance of doing it in the forseeable future. Nevertheless, there are several progress stories within the SENS narratives that are weebles. Many gerontologists expect that we could get twenty or more years of vital, healthy longevity if we had a much better understanding of aging (senescence) at the molecular, cellular, organ system, and physiological levels. We’ve also been able to do this, to some degree, in mice, and in calorically restricted people. So getting us to appropriately prioritize longevity research, by telling better longevity weeble, possible, and progress stories, is a very worthy goal. Consider the common stories of biological humans going to space (beyond near earth orbit) or the stars in any significant numbers, or colonizing Mars, a hostile, airless, and and far-too-small planet, at 38% of Earth’s gravity, for more than a handful of explorers to live there for any length of time without doing permanent damage to themselves. Biological humans living on Mars is a faulty story that continues to inspire much innovation in space science and technology. A much better story is sending a few explorers to Mars for short rotations, like we explore other extreme environments, primarily for the thrill and adventure of it, and secondarily to do a little new science, and get a few benefits back here at home. That would be an honest assessment. Since 2000 I have given talks and written papers on a topic I call the transcension hypothesis. This possible story (testable hypothesis) proposes that the developmental trajectory of intelligence in our universe is migrate further into inner space (denser, more miniaturized, and more virtual and information-rich domains), the more complex we become. In this story, the leading edge of complexity increasingly leaves behind the slow, expensive, and boring domains of outer space, at every step in our evolutionary development. If this hypothesis is true, humanity will send ever more sophisticated robots, experiments, and sensors into our solar system in coming decades, but almost everyone alive will stay focused on building ever more complex and adaptive minds and bodies right here on Earth. There are a number of physical theories, some speculative and others using conservative physics (relativity), that argue we’ll be able to instantaneously connect with intelligences everywhere else in our universe, if we are able to achieve black hole-level densities in our future civilizations in coming centuries. If these theories prove true, going to inner space is not only how we’ll continue to exponentially increase our individual intelligence and adaptability, it is also how we’ll quickly meet all our intelligent neighbors, and compare and contrast all the incomplete things we’ve each learned about the world. I came to this possible story as a youth, contemplating something called the Fermi paradox. I’m hopeful that this story is true, as I think it explains the future of current acceleration processes better than any other I’ve come across, so I continue to tell it to critical audiences and relevant experts, and I continue to look for objections and weak points. I don’t think it is faulty, but I may be proven wrong about that tomorrow, by anyone. Eventually, if this story survives enough diverse and careful critique, it may even become a weeble. We shall see. We need to understand all the faulty stories that the public, and our clients, cling to, and gently help them to realize their implausibility, so that they can refocus their limited time and energy and craft better foresight, strategy, and action. In our next generation of open foresight platforms and processes, we can hope that the global community of future thinkers will raise the level of serious dialog on our future stories in coming years, expose the faulty ones, and make better future thinking accessible to everyone. Futurepedia (Chapter 9) is our idea for a particularly broadly understandable platform for such an objective. When you tell important future stories to the people who need to hear them, they will sometimes be sharply criticized, occasionally in particularly biased, ideological and non-evidence based ways. Good foresight professionals take both founded and unfounded criticism in stride, giving people the opportunity to express themselves, not overreacting, staying calm and humble, and continuing to marshall support from those who see the value of the story. Look for feedback first, as your story is developing, not from general audiences but from those with the appropriate expertise to evaluate it, and from those most ready to seriously engage the evidence and arguments. It may be your ethical duty to tell your story, as best you can, if you think you see something that could prevent pain or create a better world for your clients or the world. But you can also be empathic and humble in your approach. Be sure to also solicit feedback, after you’ve developed a story, from those that stand to be most negatively impacted by the coming changes that you envision. The more gracious and charitable you are with those who disagree with you, the faster your and your audience’s learning may occur. If the evidence and critical history supports your story, you can expect it to bounce back from waves of criticism and become a weeble with time. Your story may lose a particular media or public relations battle, but it will eventually win the war. If it is a possible story, and you never intend it to become a weeble, as with self-preventing prophecies, construct it well, and solicit feedback. If you are telling a faulty story and identifying it as such, to help others also see its faults, again be humble in your approach, and focus primarily on the faults you feel you can most defend. Every faulty story has many elements that are also true, and worth pointing out, to find common ground. If your clients or audience remain ideologically and emotionally attached to faulty stories, be empathetic, and try to gently raise their awareness about the evidence and criticism already available, and ask them what kind of new evidence or experiment might help resolve the conflict between their world view and your own. ….. “Uploading of human memories, and possibly human personality, into computers, as a kind of digital immortality” – am I not doing this while saving this comment?…. I would consider BOTH engineered life extension and personality ‘uploading’ onto a different matrix as wildcards. If anything, regenerative medicine sounds more “weeble” to me, as newborns’ cord blood is routinely frozen today in liquid nitrogen, and replacement organs, up to and including replacement brains can be produced for an aged individual starting from time zero. One may be growing and aging, while one’s stem cells are kept in a full anabiosis and outside of the course of biological time.